Decorative Cladding. Exeter, Dawlish, Teignmouth, Newton Abbot. 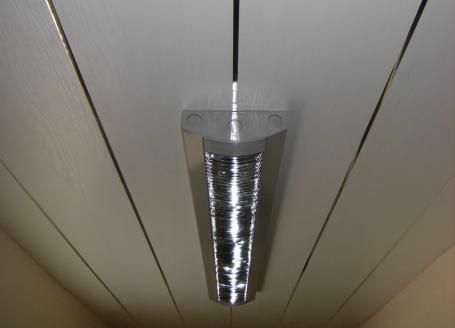 We are stockists for the Deeplas range of Internal wall and ceiling cladding systems which is an ideal product for either renovated or new build living spaces. Whether you would prefer a minimalistic, sleek look or opting for a warm social atmosphere, the Deeplas panel offers choices for all. There is a large range of finishes suited for both shower or wet rooms to hygenic and wood look alike ceiling and wall solutions. We keep 3 major colours in stock and other colours are available from order. We are able to supply only or can fit at a very reasonable rate. Interior decoration panels A broad range of profiles for interior decoration, from traditional to modern offer endless possibilities. Decor is the collective name Deceuninck give to their range of wall and ceiling panels. These Decor products offer the user a huge range of decorative options and are easy to maintain. This range unleashes the creativity in everyone. The colours, shapes and finishes available offer endless combinations, and the durability of these products means you will be able to enjoy your wall and ceiling panels for years to come. Starline offers the creative designer an unprecedented freedom of combination. These panels are perfect for the tasteful panelling of homes, offices and commercial areas as well as bathroom and showeroom ceilings. The great quality of Starline is the potential to create relief using the accompanying range of colour strips either raised or recessed. A simple principle that delivers surprising results! The panels from the Nordica range bring soft light and luxury to living areas, where rustic refinement is of primary importance. In living rooms and children's rooms, kitchens and studies, the Nordica panelling comes into its own. Wall finishing with class and quality. Matching finishing profiles provide the final touch. Those who choose Vermont will simultaneously bring home the warm radiance of wood and the practical benefits of PVC-U. It is particularly in living rooms and working areas, where cosiness and comfort are primary factors, that Vermont panels come into their own. There are two profiles in the Vermont range: one in a width of 100 mm, one in a width of 250 mm. The designs of these two profiles link up with each other beautifully in terms of design, and, owing to their identical V-groove, they can be easily combined. Matching finishing profiles are also available. The most cost effective product coming in 16 exciting colours suitable for all applications. With a width of 333mm and lengths of 2.6m, the Primavera range will enhance any existing or new build project and with 4 major colours held in stock there’s no waiting for this popular board. The Pacific is a flat, seamless panel. With its water repellent characteristics and fresh appearance, this easily maintained wall and ceiling panelling is designed specifically for places of intensive use, such as the bathroom, the kitchen and the laundry room, as well as for commercial rooms where hygiene is important. In addition to the efficient sobriety of "lacquered white", Pacific also offers you the chance to bring about extra colour and relief using colour strips. Contact us for further details or a quote.